We want to look and feel our best. Welcome to this issue of Mineral Essence which features the crystal prescription for eczema. 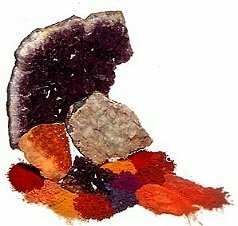 There are hundreds of healing stones that will be described from the website www.essence-of-mineral-makeup.com. Each healing stone has its own vibrational power to heal, relieve and help bring our bodies back to balance. Eczema is a skin condition that effects many individuals - especially during cold weather. 5. What do Sapphire, Green Aventurine and Amethyst all have in Common? Eczema or dermatitis is a condition characterized by dry, hot and itchy skin in mild cases and broken, raw and bleeding skin in worse cases. Hence, to establish that you have this condition, you need to be guided in the proper aids and management of this skin condition. Either way, this condition is not contagious. However, it presents a problem to your everyday skin care, hygiene and beauty regimen. On an energetic level, eczema has to do with the seventh chakra where it reflects the energy trusting life and the ability to see the bigger picture or pattern in life. Sapphire, green aventurine and amethyst are few of the healing stones that are found helpful in relieving and improving cases of eczema. Their profound effects on patients administered with crystal stone therapy using these stones prove that they stand as an effective alternative treatment to any eczema medications. With the daily application of the light and energy of these precious stones, it appeals to the healing process of the skin cells on a subatomic level. Sapphire, green aventurine and amethyst assimilate energy to the injured tissues, which stimulates the natural healing abilities of the skin. Mineral makeup allows people with eczema to still wear makeup. Sapphire is a healing stone of prosperity which helps one see the bigger picture of life. It sustains our life gifts, eliminating frustration and fulfilling dreams. It helps strengthen the power of belief and love for truth. It helps us clear out our intentions, bringing about a realization that makes it easier for use to accept life as it is. It contains a mineral that is found in kaolin clay of many mineral makeups. Green Aventurine is an excellent anti-inflammatory stone. Dermatitis is the inflammation of the skin. It contains the mineral silica found in mineral makeup. With this stone’s help, you are able to grow and develop in an ever growing space without restriction. Amethyst is one of the best healing stones for the skin. It helps alleviate sadness felt when separated from a loved one. It brings you an inner peace so that you are able to re-open yourself up to the world. This stone also contains the mineral silica found in many minerals makeups. They all belong to the oxides class of minerals which means they have an element combined with oxygen in a binary fashion. These oxides are very hard with a high specific gravity. Oxygen is necessary for life. Life is a gift to better ourselves and it is meant to be beautiful. The elements found in these stones correspond with silica and kaolin clay both found in mineral makeup.